Social media networks continued to grow, expand and sometimes even explode during this past year. New apps were added, new functions created, new networks launched in a frenzy of competitive emulation. But was it all really necessary? Aren’t people overloaded with social networking itself – let alone coping with change after change, new launches and other new shiny social baubles? So what has changed globally about social networking? What made 2012 a landmark year? First let’s take a look at the most notable shifts and changes. Visual media such as Pinterest and Instagram experienced a volcanic rise in 2012, causing (or perhaps responding to) a major shift in social networking habits and the collective consciousness only partially explained by the corresponding rise in mobile device use. In fact, Pinterest “referred more new business than LinkedIn, YouTube and Google+,” according to British firm, The SEO Company. Meanwhile, the rocketing popularity of photo-sharing resulted in Facebook’s Edgerank algorithm (which weights photos more highly than any other type of media) becoming public knowledge. Popularity also brought along problems: Email viruses purporting to come from Facebook rose noticeably. And while other social networks grabbed a satisfactory share of the market and improved their platforms dramatically, Facebook was still the star of the show, as The SEO company clearly demonstrated, based on Mashable findings. 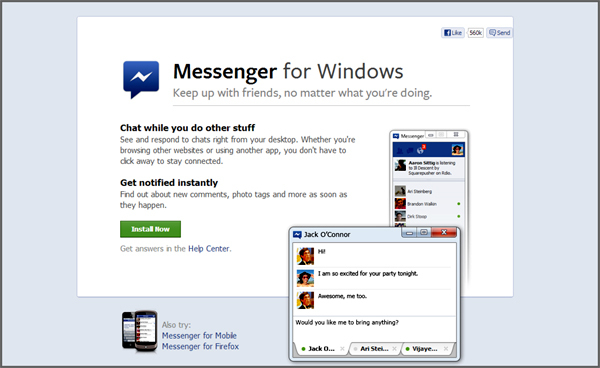 This was the year people found out that Facebook had officially released Messenger for Windows 7, allowing Windows 7 users to access Messenger without a browser (and thus pushing back competition from Google Gchat). Part of the new Timeline organization of personal news-feeds involved a new header area, consisting of tabs, a Cover Photo (background photo) and a Profile photo (head-shot or logo). 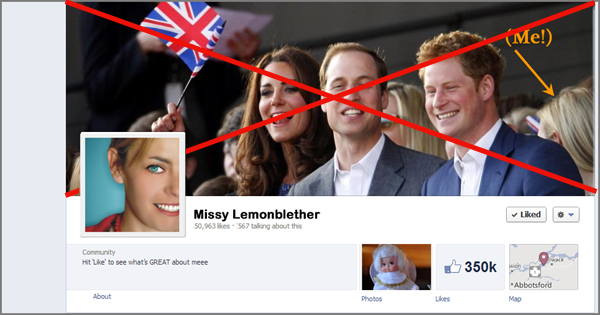 Facebook was firm in its guidelines – no promotional items or text in the Cover photo. But it wasn’t long before people started ignoring that. Any copyright content – For example, movie shots, album covers or original artworks from well-known artists (or artists with a strong web presence). So no more featuring your head-shot against a backdrop of Hobbits trudging through the snow; or against your favorite band performing onstage; or cozied up to Royalty. Facebook acquired the rights to the facial recognition software it had been using, according to an announcement on Face.com’s blog in June 2012. You are already familiar with Face.com through Facebook’s photo-tagging process. Face.com already reputedly supplies certain other Facebook apps, including Photo finder (what you use when you locate tagged photos of yourself and un-tag them. So the acquisition seems a logical step. But what are the implications? Well, potentially, you could find Facebook “recognizing” every photo you’ve ever appeared in – whether these belong to your account, other peoples’ accounts or institutional accounts/Facebook pages. Yes, Facebook did get rid of “Gifts” a couple of years ago, but like Heather O’Rourke says in the movie “Poltergeist”, “they’re ba-ack…”. Well, at least for some people. If you have gifts enabled, you’ll see the present-box icon beside friends’ birthdays or with their posts, if you check their walls. 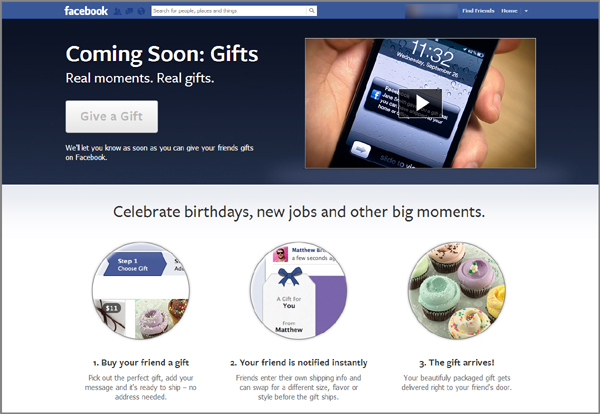 If you can see the gifts icon, this Facebook help page further explains the process. Facebook isn’t the only social network determined to push ahead. 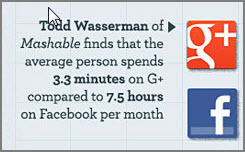 Google has been doing its best to go one step further than its gigantic rival – particularly with visual sharing. One sore spot among Google+ users concerned with branding and SEO was the way people creating new accounts on YouTube could apply their Google+ user names to their channels. Existing YouTube users could not. So now there’s a fix for that. Those using YouTube for business purposes will appreciate the branding opportunity of syncing Google+ and YouTube accounts; plus the increase in Google searchability. Facebook purchased mobile photo-sharing network Instagram – reportedly for one billion dollars. Hard on the heels of this purchase, Facebook began to make unmistakable noises about eliminating user voting on its “governance policies”. There has been alarm over the idea of Facebook building user profiles using data shared between its own network and Instagram’s. Facebook has gone on record as saying that storing Instagram “server logs and administrative records” on its own systems is “standard for the industry”. Prior to this, Mark Zuckerberg himself went on record as saying Facebook was “committed to building and growing Instagram independently”. Instagram’s acquisition was reportedly in the works prior to Facebook shares going public. 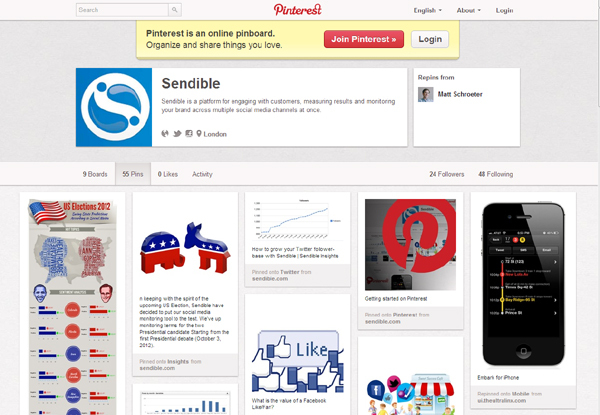 And now the development we’ve all been waiting for – Pinterest business pages. Not only can you now join Pinterest as a business, you can create a Pinterest business page. If you already have a Pinterest account, you will have to convert it from personal to business. 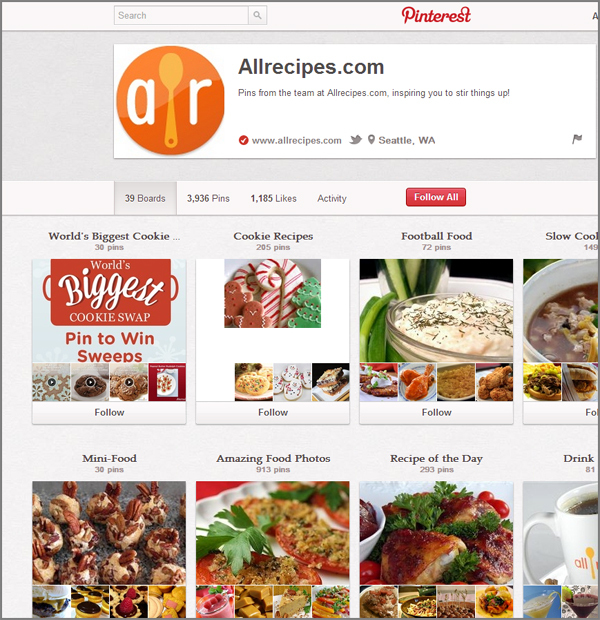 Pinterest then walks you through the page creation process. And it seems as if the social media world has finally woken up to these facts. That being said, only one thing seems consistent about social media networks in 2012. They are constantly changing and growing along with their users. One of the most powerful assets Sendible offers to your business is its Reports feature. 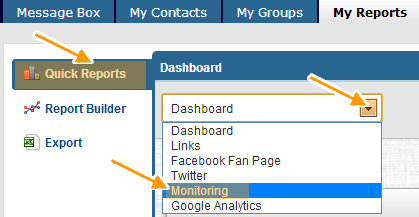 You can access this instantly via your Dashboard by clicking on the “My Reports” tab. This feature works powerfully both in helping you monitor and in allowing you to accurately track your social media presence. Mentions – your keywords; and whether or not these mentions were positive or negative. Before you can read any data, however, you need to build your first report. 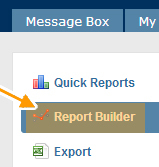 Click on the “My Reports” tab, if you aren’t already there, and select the “Report Builder” tab in the left-hand vertical sidebar menu. Select your layout from the templates indicated. Only you will be able to see the contents of the “Report Name” field, so go ahead and populate it with whatever you want. Everyone who accesses the report will be able to see your “Report Title”, so put some thought into a strong title, preferably with a relevant keyword in it. You can also select the exact period of time you’d like the report to cover (seven to ninety days). The moment you click “Next”, you’ll be given a selection of modules you can add. Choose the most relevant ones by clicking on the green “Add” buttons. When you are done, click on the “Close” button. The next page shows you your report skeleton and presents you with a button you can press to upload your logo (260 X 100 pixels), as well as allowing you to edit your personal data in the far right side of the report header. Underneath, you’ll find the data…. 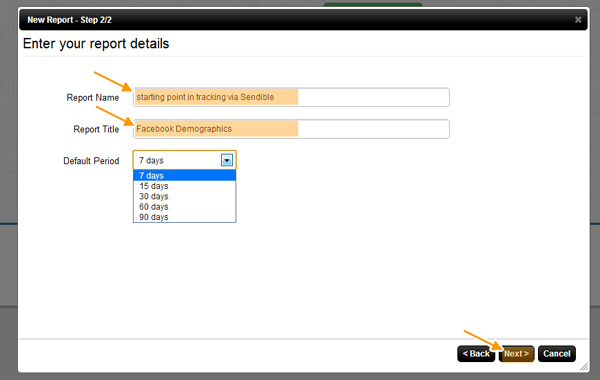 Sendible’s “My Reports” functions becomes invaluable in analyzing data and monitoring your social network, email and site interactions. In addition to all the fields you can add when populating your reports, you can also go to the “Quick Reports” tab in the left-hand menu and select even more functions. You don’t have to “interpret” in any one of these sections: Simply read the results, which are all sorted, tabulated and in many cases compared for you. When you’re ready to collect new data and create a new report, go back to the “Report Builder” tab in your “My Reports” left-hand, vertical menu. You will see the last report you created – but on the extreme right-hand side in the Header section of your report, you’ll also notice the bright green “New Report” button. Press it, and you’ll be able to “Add Modules” again. Last time you created a report, we focused only on the vertical Modules within “General Reports”. 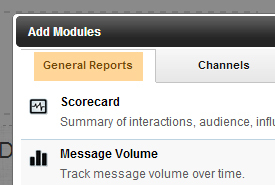 This time, check out the horizontal tabs in your “Add Modules” section. “Channels” lets you set up and track activity across all your social media accounts: Your Facebook Page, Twitter accounts, Facebook accounts and more. 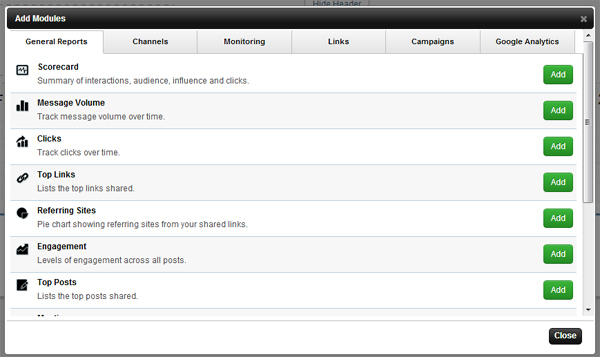 “Social Media Monitoring” lets you monitor all your “mentions” – positive, negative, over time, by source and more. One tip, however – make sure the keywords you select is highly specific to your business. If you use a general keyword such as “business solutions”, you will get a flood of “junk” results. Do be sure to scroll down in the “Social Media Monitoring” section. You won’t want to miss the chance to add a “Sentiment” pie chart – one of your quickest barometers of buzz-worthiness – and setting up a “Sentiment Comparison” between your social networking accounts. This demographic alone is unique in that it fairly accurately measures intangibles such as liking, long thought to be non-empirical and non-measurable. 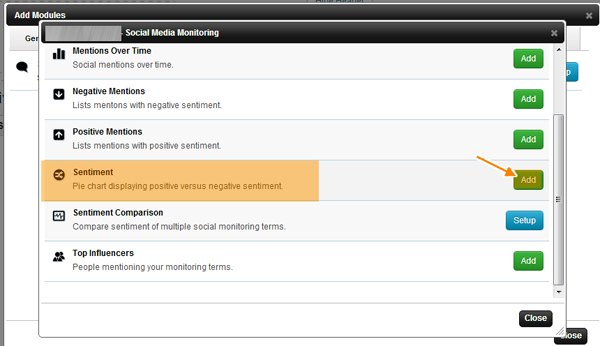 “Sentiment Comparison” is a good category to add if you have multiple social media accounts. And, finally, “Top Influencers” can show you who has been busy either competing or promoting your keyword the most (if you chosen keywords highly focused to your business USP). “Links” won’t be hugely valuable if your business is fairly new: However, if you’ve built up solid backlinks, it’s worth your while throwing into your mix for this second test report. “Campaigns” is another tab that doesn’t look too impressive when you first click on it. (In fact, it looks rather lonely.) But press the “Setup” button for its one solitary field, “All Messages”, and it opens up a treasure trove of tracking options. Google Analytics is your final horizontal-tab field to add. You can instantly set up full analytics measurements – and you’ll never have to log into Google again to see your stats. Don’t neglect location-based targeting and measurement in your campaigns. Even if you do one hundred percent of your business online, you may uncover a hidden gemstone of a local market who will buy from you simply because you’re someone they either know (at least by sight, if you’re putting in quality time investing in your community) or just someone from their home town. 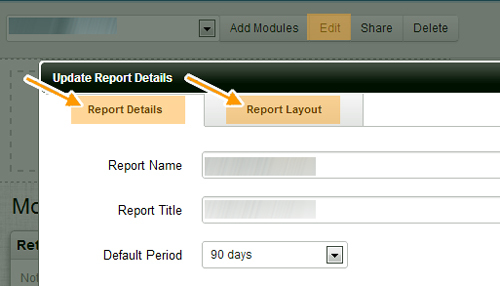 You can also “Edit” your report within the “Add Modules” section, which allows you the ability to change either the layout or the details within the report, making for a tighter, more focused report. Get into the habit of editing your details. Not only will it look and read better, it will give you a stronger, clearer picture of where your business online visibility and interaction level is really “at”, and what sort of actions you will need to take in which areas, to improve your statistics. Finally, remember to check out the horizontal tabs under “Add Service” in “Add/Edit Services”. 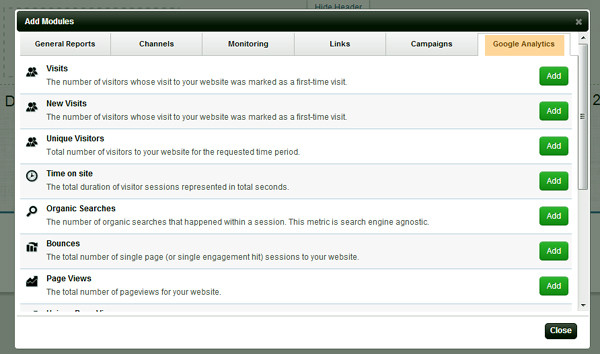 The more relevant streams you add, the more complete your tracking and monitoring results and reports will be. “If you use it, add it” is a good rule to start out with. And if you decide a stream is just not worth including, or you suspect it skews your results, you can always remove it later. Get in the habit of keeping up with Sendible Insights – and don’t let the name mislead you. It is in no way a copy of Facebook Insights: Instead, it’s more of a blog that provides both basic and heavy-duty social marketing tips and news. Visit Sendible Resources before you start hunting for answers elsewhere. This comparatively hidden area of their website contains not only the most clear and well-organized tutorial sections, but it also presents you with actual case studies you can follow, if you’re more of a “hands on” must-see-it-for-myself sort. Visit the Getsatisfaction “secret” forum. Well, actually, it’s not so secret: In spite of the fact it is now no longer active and archived (as well as “unofficial”, with a big site disclaimer denying any Sendible affiliation), Sendible’s support team actually includes it as a resource under their signature in automated replies. While much of it is out of date (or about to become so, with Sendible’s recent upgrades and changes), it is still a place where you can find the odd diamond when hunting for glitch solutions (and waiting for Sendible support). There is much more to Sendible than we’ve touched on, but it’s something you can’t learn overnight. You need to try it, tweak it, find what works best for your unique business – but these tips should help you start out with a firm foundation. Oh. And don’t forget to measure and track how much time Sendible saves you! 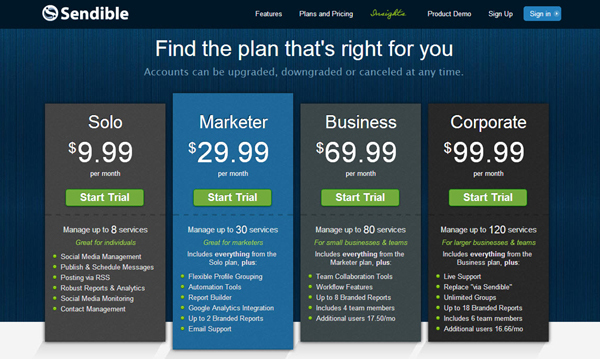 Sendible allows you to automate a multitude of tasks and functions for your business. Some of these features are definitely ones you need to grasp right at the beginning as they’ll make your life a lot easier. One of these functions is group set up and handling. Instead of sending or assigning messages individually, you can designate a Sendible group to take care of an issue or task. And you don’t necessarily have to group people: You can create a group of email addresses or social media platforms. 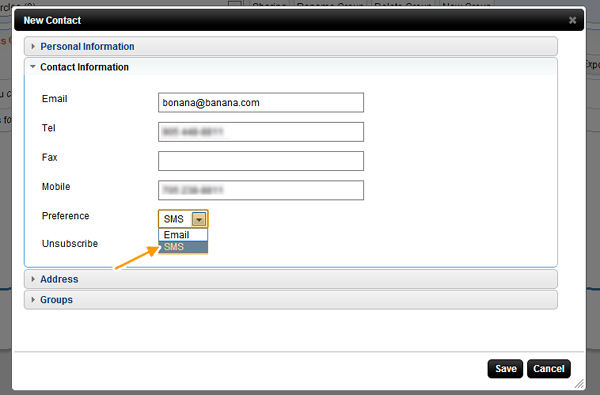 You can also send SMS Text Messages – even from your mobile. You can separate employees and contractors into groups of email addresses, if yours is a larger company. For example, if you are a magazine publisher who makes use of social media or blogging, you can create a separate group for Production staff, one for Editorial staff and one for Distribution staff. So are you ready to set up your first Sendible group? Nothing could be more simple than creating a new group. While at your Message Box, just click on the “My Groups” tab. When you are ready, enter your group name and click on the button. 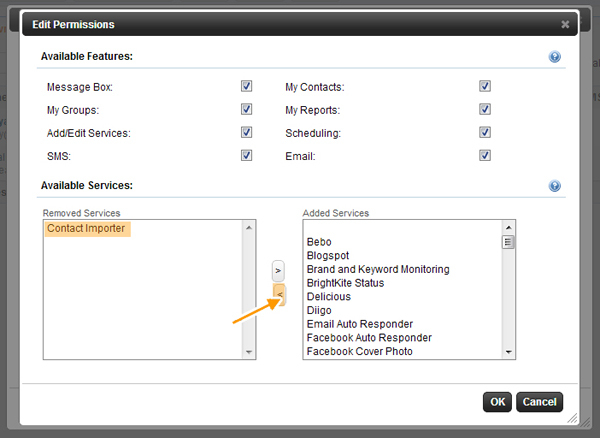 Once your group is created, you’ll find it in your Message Box services category. One of the nicest features about groups is that each one you create will automatically generate and present you with its own email address, allowing you to post group messages to anyone, including external mail servers. You can also post to as many types of groupings as you like – all in one post action. You can post to groups of just about anything – a group of all the blogs you own, so that you update them all at once. You can have all your email contacts in a group; all your Facebook Pages in a group. Then access them all at once from your Message Box. So setting up a group is easy… but then what? The sad fact is that once your groups are set up, managing them is sometimes not as straightforward as Sendible would have you believe. Parts of their User Manual seem to be out of date, and here and there the odd glitch seems to happen. Unfortunately, these glitches seem to happen right in the most important areas. Here are the answers to the most commonly-expressed handful of frustrations. A: The only thing Sendible’s user manual has to say on the subject is that you should “favorite” the group by clicking on “the little yellow star” on your group listing’s right-hand side to make it appear. A: If you can’t find your groups in “Add/Edit Services”, direct add them through Facebook from this link. You will be walked through the process of locating and easily adding your groups. Q: “Why doesn’t the link preview appear when I post to LinkedIn groups via Sendible? A: The problem is with LinkedIn’s API. There is nothing that can be done from Sendible’s end (though LinkedIn is in the process of making changes). In spite of the occasional issue, Sendible Groups can provide a powerful tool to those concerned about maintaining a strong presence on social networks. 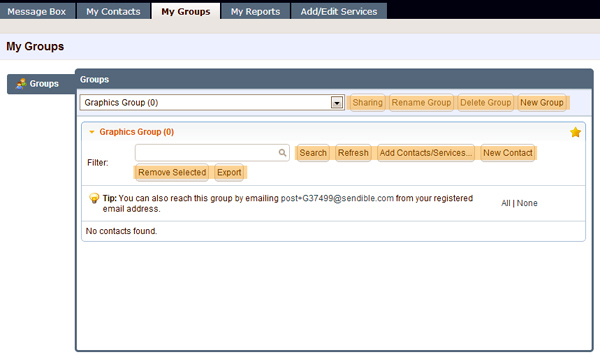 Not only can you email groups via Sendible, you can send text messages too. When you are setting up a new Group, it’s easy to add individual Contacts, one by one; then ensure your main method of contact will be SMS text messaging. Once you’ve entered the basic profile information, select the “Contact Information” slug. When the “Contact Information” slug opens up for you to populate it, simply mark “SMS” as your contact preference for that individual. One of the most exciting factors about Sendible is its ability to help you brand your business. 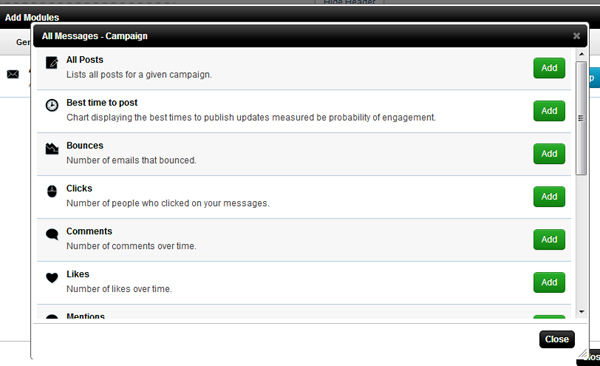 In fact, you can easily create branded posts from right within your Dashboard and link them to your Facebook Pages. Select the “Add Ons” tab and choose the option you want – either add Facebook Pages or buy the ability to put your own branding in place of “via Sendible”. If you’ve added a Facebook Page and branded it, be sure to “Save Settings”. You will see a notification that your Facebook Page has been successfully added. Click “Ok”. Those who use blogging as a way to increase web identity and presence will particularly appreciate this tip from the Sendible Community Help forum. Scroll to the bottom of the page and click “Save”. While you’re still in “My Profile”, open up the “Time Settings” slug and select the clock preference option that works best for you – twelve hour or twenty-four hour. Before you leave “My Profile”, set your “URl Shortening” preferences too. And, of course, make sure you “Save”. There are so many features available with Sendible that you will almost certainly need to ask for assistance occasionally. Fortunately, there are several ways to find the help you need, besides clicking on the “Help” link at the extreme top-right of your page. Get in the habit of watching for the green tip popups at the top of your Sendible screen. This is where you’ll find notifications about upcoming webinars, new features, changes and just plain old tips! Use “Live Chat”. This option is not always available (depending on the time of day in your Time Zone) but when it is, you’ll see a black pop-up in the bottom right corner of your screen. Click on it to speak immediately to a live operator via the Olark platform. 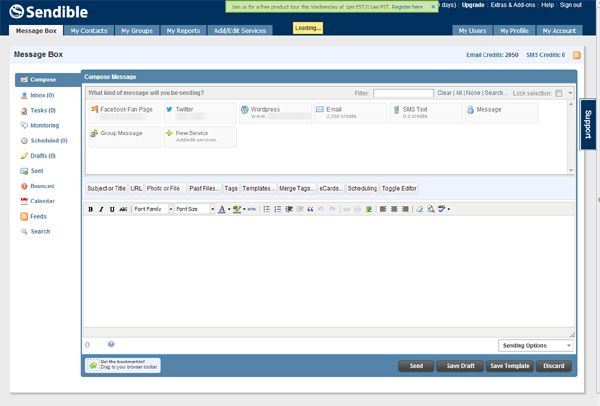 Use the “Support” vertical tab on the right-hand side of your screen (powered by Zendesk). Simply type in your question and hit the “Next” button to see the closest and related answers from the Sendible database. Get into the habit of using Sendible forums. Browse their data or ask questions. What you don’t find in the User Manual or “Help” section, you’ll most likely find here! Finally, experiment! Start using Sendible – if you make a “mistake”, help is never more than a tip away. It may seem obvious, but the real key to putting the power of Sendible’s features to work for you lies in getting to know and use your Dashboard. Do this and it won’t be long before you have streamlined Sendible into the powerful tool it was meant to be for you and your branded business. Sendible’s team management tools and abilities give it extra value to those who outsource, manage, serve or employ others. But it isn’t only clients you can include in your Sendible stable: Create valuable team members from your employees or favorite, regular freelancers – team members who can take care of tasks for you, receiving as much or as little supervision and accountability as you wish. Sharing is secure and easy, thanks to Sendible’s ability to assign or deny specific permissions for each of your users. No passwords involved (except the Sendible password you create for them). The types of permission granted can vary too: You can assign strictly sharing privileges for specific social network accounts without having to share your password. You can also grant administrative privileges, depending upon team needs. One other useful feature that allows you to ensure quality and consistency of all posts and messages is the ability to approve team member content before it is posted. First you need to grant your team member access to your Sendible account. Logging into your account will automatically put you at your Dashboard. Click on the “My Users” tab, upper right-hand corner. Once you’ve opened the User section, click on the Sharing tab. A popup will open up, asking you to fill in the user contact details and advising you how many user slots are left for you to fill. Go ahead and fill in the details for this user. If they belong to a different company than yours (e.g. your new user is a freelancer who has their own company name) you can change the “Fullname/Company” field to reflect this. 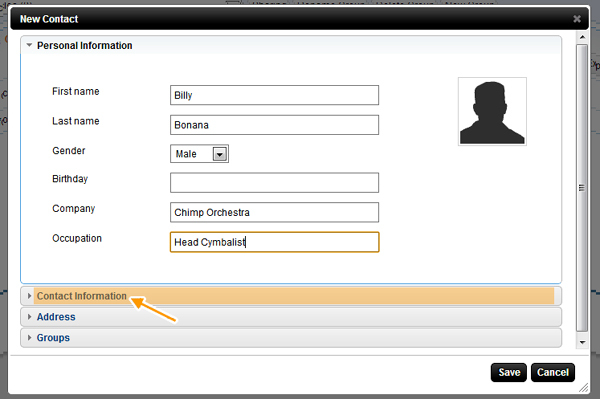 Note that you can use a drop-down menu in the “Managed by” field to change the person who manages your user. Use “Team Member” if you wish to restrict your employee or freelancer to specific areas, tasks and privileges. 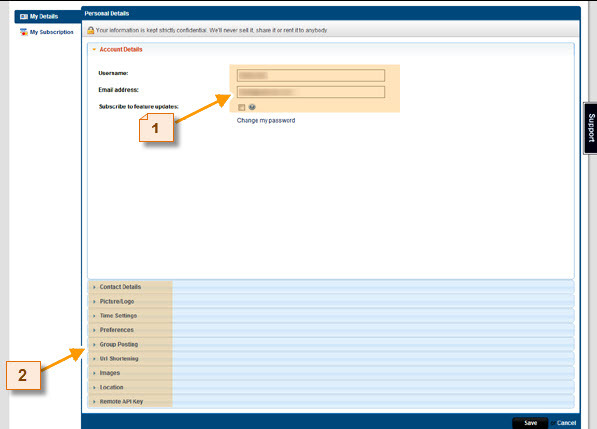 Use “Administrator” if you wish your user to administer and have access to your entire account. One last action to take: Slide your eyes down to “Approval Workflow” and decide whether or not you need to approve your new user’s content before it is published. If you wish to change this setting, select “edit”. Finally, when you are satisfied the New User popup is filled out correctly, click the “Save” button. Note that you don’t necessarily have to be the one who oversees all team members’ work. In fact, you can go back any time and edit “Approval Workflow” to assign management of other team members to someone else on your team. For example, let’s say you’re the Administrative Editor of a magazine, and you’ve become so busy, you’ve just hired Merlin Smith as your new Managing Editor. You can then assign all writers you’ve added to your Sendible team to Merlin Smith. He is now the person in your company who approves everything your writers submit or post. You don’t even have to worry about who’s doing what. User/writer John Doe reports to Merlin Smith. Managing Editor Merlin Smith reports directly to you. Now you only deal with one person – not a dozen. You are free to focus on making executive decisions for the magazine. You can also set separate permissions for each user. Click on the “My Users” tab. Select your team member. 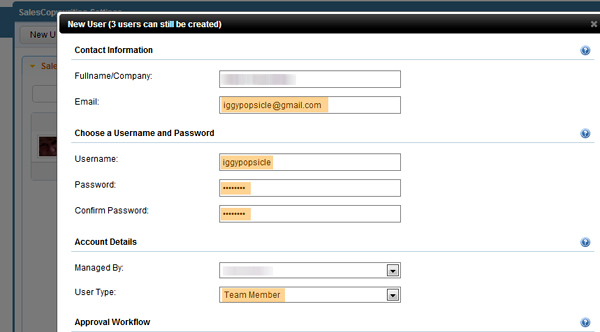 When the popup for that team member appears, select “Permissions” from the bottom tabs within the popup. Another popup will open up. You can check and uncheck the boxes in the upper portion to grant or deny access to available features such as reports, groups and SMS. You can also remove services available to that user by highlighting the service in the “Added Services” field, then using the backward arrow tab to send it over to your “Removed Services” field. Your user will then no longer be able to access that particular Service. 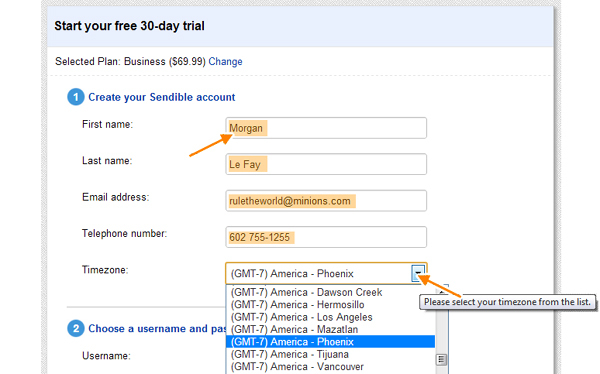 You can customize Sendible for your team members even further. 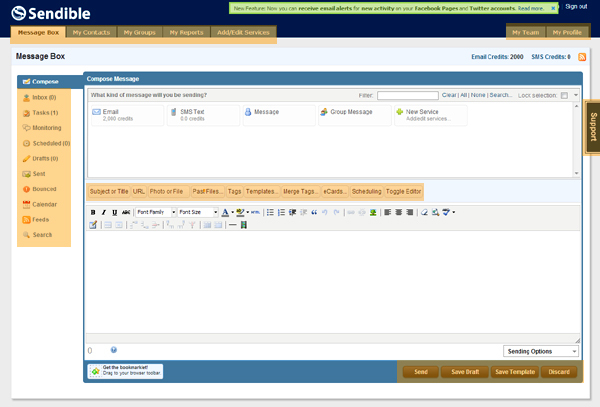 One way is to assign particular messages from your own Inbox to specific team members. Go to your Message Box and open your Inbox. Find the message you’d like to assign to a team member. 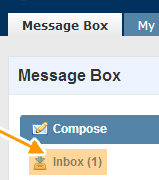 Without opening the message, mark the checkbox to its left, then click on the “Assign” tab, above it. You can then send a message to your team member, if you wish, letting her know what you’d like done with that particular message. Once you’ve composed it, press the “Assign” button. When you’ve finished assigning messages, you’ll see the company or position of each team member at the extreme right side of each message in your inbox. This helps you know immediately if someone else is taking care of it for you. You can also assign or delete tasks through the “Tasks” folder on the left hand side of your message box. The beauty of Sendible is that you can instantly allow team members access to certain social networks and clients without having to share confidential passwords with them. Simply assigning these Services to your team member will allow them access to specific clients, tasks and social networks and services when they log onto Sendible. 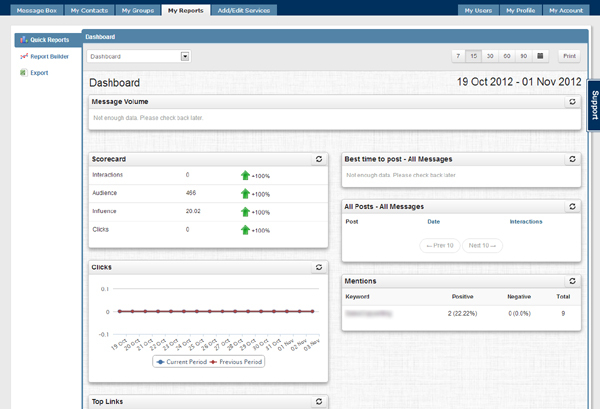 You can also assign team members to monitor different messages from your “Monitoring” tab in your Message box. Just select the checkbox to the left of the message you want your team member to monitor and then click on the “Assign” tab and choose the appropriate team member. Step 5. Let your Team Members Know! There is sometimes confusion reported among business owners on the subject of notifying team members they’ve been added to Sendible. Your team member then can then access Sendible and see what tasks have been assigned to her, send and receive messages, and discover what other privileges she can access. And anything else you need to tell her. Two links you might find helpful as you first navigate your way around this incredible social Dashboard: Sendible’s User Manual and YouTube Channel, where you’ll find twenty-three “how to” videos – including a Quick Start video. Sendible can feel a little tricky at first, but once you’ve got a few functions under your belt and slip into the Sendible mindset, it should suddenly all click into place. It sounds like hype to say it, but once you’ve set up your team protocols and assigned responsibilities, it will feel as if your team is virtually managing itself. The key is good initial communication, so once you’ve got everyone on your team in sync with Sendible, you should notice less confusion, less stress and better communication all round. …all from one simple platform. Its many benefits include saving you time and reducing the confusion of managing multiple platforms and users. We reviewed many social media analytics and management platforms over the past few years. This one works best for us and our clients. So instead of a traditional review, we will actually walk you through the process of setting up so that you can try Sendible for yourself. Since there is a free trial there is no risk in checking it out for yourself. That’s what we did. Signing up is easy and there’s a “risk-free” thirty-day trial. Click on the sign up link in the top right menu bar. A selection of plans at varying prices will immediately open up. If none of the plans quite fits your needs, contact a Sendible sales representative at 1-315-623-4480 to see if you can work out a custom plan. Once you’ve selected a plan and clicked on the green “Start Trial” button for that particular plan, you’ll be asked to provide your personal information. Go ahead and enter your name and contact information. Next, choose a username and password. If you decide you need a lighter or heavier plan than the one you signed up for, you will not be stuck with the type of account you signed up with – upgrading to any paid plan is acceptable. Once you do upgrade, you will be billed for the first month immediately via your credit card (payment is always one month in advance). You can also upgrade or downgrade at any time – the change and new charge will take effect on your new billing cycle. If you decide to cancel, you can do so at any time within your trial period. The date your free trial ends is displayed right underneath the black “Start Free Trial” button. Once you have selected the black “Start Free Trial” button, you will be asked to set up your profile. You will notice straight away that your company name and URL have already been pre-populated in the Textarea boxes for you. You then have the choice of allowing Sendible to automatically begin searching social networks and web content for mentions of your business. If you don’t wish Sendible to begin this process right now, ignore the black “Continue” button and select the “Do this later” link. Check your email inbox for Sendible’s Activation letter. You can activate immediately via the “Activate your account” button at the end of the letter or continue with setting up your social networks and activate your account next time you log in. If you’ve allowed Sendible to search for your networks, it will walk you through an easy set-up process for all your social networks. You’ll see a screen straight away asking you to add your Twitter account. Select the black “Continue to…” button to be taken to an authorization page, where you will click on the “Authorize app” button. The moment you’ve done this, you will see a message on your screen for a few seconds letting you know the process is in progress. When it has added Twitter to your profile, you will see the next social network set up screen; in this case, Facebook. Select the black “Continue to Facebook” button. As with Twitter, you’ll be taken to the log-in page. Enter your Facebook username and password. Once you’ve done this, you’ll be asked to authorize the Sendible app. Be sure to select exactly who to display Sendible posts to by using the drop-down menu under the default “Public” button. Once you’ve selected your preferred Sendible/Facebook privacy setting, click on the “Go to App” button in the top-right corner. 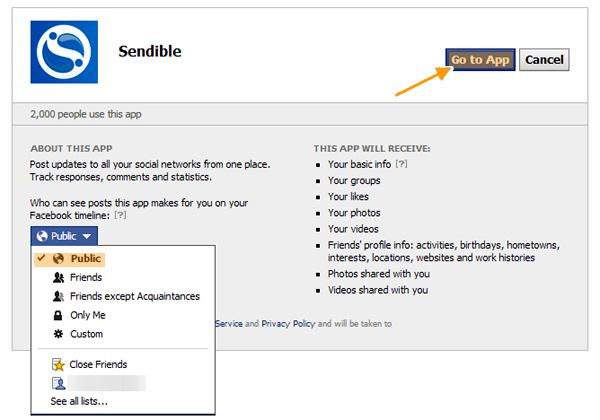 You’ll be taken to another page asking you to allow Sendible to take various actions on your behalf in Facebook. Click on “Allow” to give permission for all actions. If you don’t want to give permission for a particular action, simply click on the “X” to the right of that action description, and select “Don’t allow” from the drop-down menu. 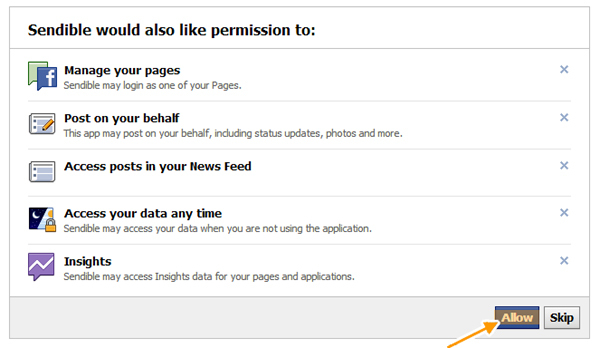 Once you’ve clicked on the “Allow” button, Sendible will also prompt you to add your Facebook Pages, plus select Pages you like; all from your “Pages I admin…” drop-down menu. 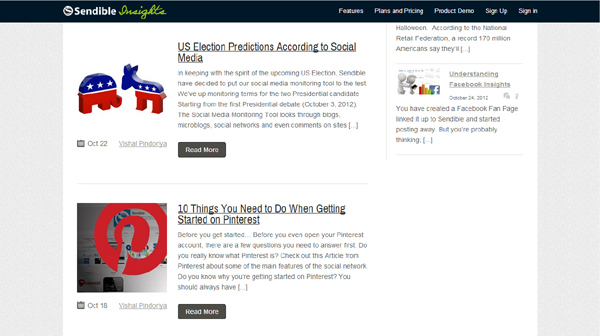 Once you’ve added your social networks, Sendible will ask you to add your blog. 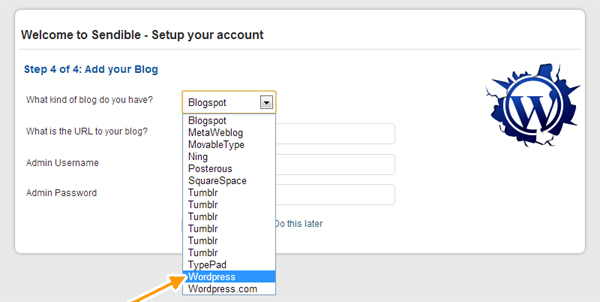 Your first action will be to select your blogging platform from the drop-down menu. 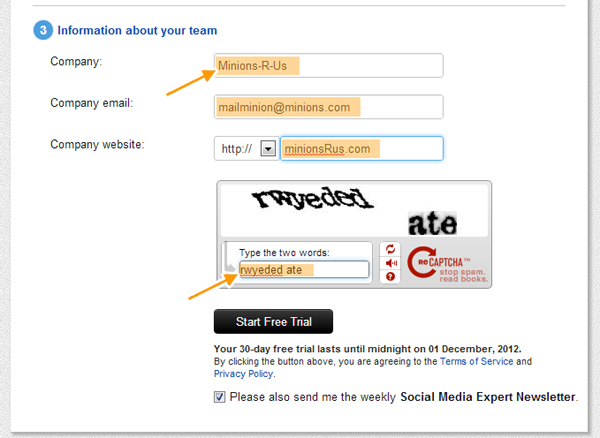 Once you’ve selected your blogging platform, add your log-in details. You’re almost there. 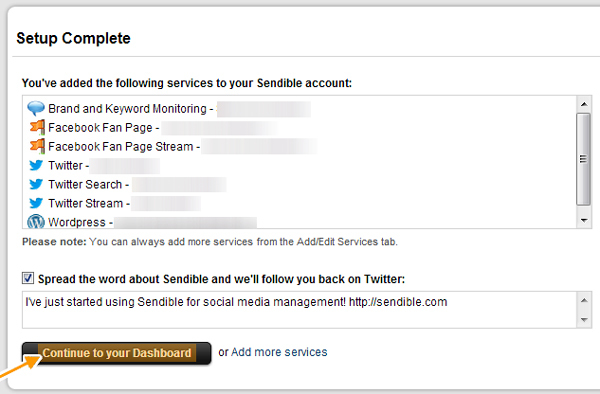 Sendible will now display a summary of all the social networks, pages, platforms and sites it has added. You can now continue on to your Dashboard. This is where all the magic happens. Note that you can compose messages in an area that looks very like a WordPress blog “Add Post” area, with very similar formatting options. The best way to learn all about these options is to play around with them and start using them: But before you get to that stage, one last thing you’ll need to do is set up your Profile. Click on the “My Profile” horizontal tab in the upper right hand corner. This opens to a page that lets you edit your personal details (#1), subscriptions and other categories (#2). When you’ve adjusted these categories to your satisfaction, be sure to press the “Save” button! This is only just the beginning of your journey with Sendible, but already you will have seen how easy it is to get started. You’re well on your way to eliminating the clutter and confusion of multiple login details and folders while dancing between different platforms and sites. 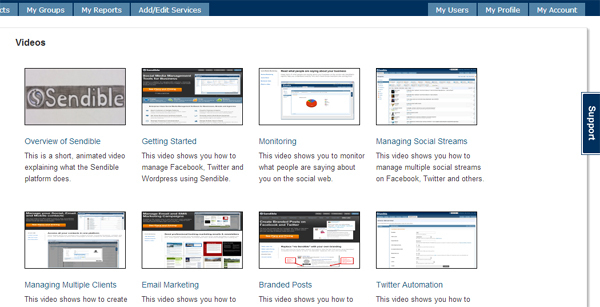 Sendible makes it easy for you to manage all your communication and monitoring in one easy Dashboard. When you are ready, you can try it for free today. This video explains how to add a Yahoo signature image with a clickable link. Note that the video explains how to add the image to your Yahoo signature using the new Yahoo email interface. The directions for the Yahoo Classic email interface is different. Google doesn’t always make it clear on how to add images to Gmail signatures. This tutorial will walk you through the exact steps on how to add an image or images to your Gmail signature.